With July being a particularly hot month, I wasn’t expecting much in the way of chocolate baking, but it turns out we can’t be prised away from our ovens that easily. Of course not all of these 13 baking hot chocolate recipes are baked ones and those that are tend to be in and out of the oven in a trice. We’re talking brownies and cookies here – it’s the sort of talk I like. I do enjoy doing these We Should Cocoa round-ups, but my goodness they make me hungry. If you’d like to join in with next month’s #WeShouldCocoa, scroll down to the bottom of the post and you’ll find the August link-up. If you haven’t joined in before or need a reminder, you can find the guidelines on the We Should Cocoa page. When you need a good chocolate fix and a therapeutic baking session, Angela from Only Crumbs Remain reckons these coffee & walnut brownies hit the spot. Chocolate and peanut butter is one of my favourite combinations. I am not alone it seems. These dark and chewy chocolate peanut butter cookies from The Gluten Free Alchemist are simple to make and incredibly easy to demolish. Banana cake is another firm favourite and it gets even better with chocolate. These banana yogurt cupcakes with chocolate chunks from Chez Maximka are guaranteed to cheer up any forlorn boys looking for something tasty to eat. Brownies are ever popular and with good reason. These booszy brownies from Caroline Bakes contain whiskey and are coated in an Irish cream liqueur glaze. Chestnut chocolate pots with a raspberry puddle sound wonderfully glamourous. Elinor at the Beach Hut Cook assures us they are super simple to make. On my list! Combine tahini, sesame seeds, mascarpone and chocolate and you’ll end up with these luscious chocolate sesame sandwich cookies from Green Gourmet Giraffe. These Nutella Bueno cupcakes are a dream for nutella lovers everywhere. Kat at The Baking Explorer generously made these ones for a bake sale. Raspberries and white chocolate make for a great combination in my book. These gorgeous white chocolate & almond blondies with raspberries from Jo’s Kitchen Larder can be whipped up in no time and make perfect summer picnic fare. Adding courgettes to cake is a great way to use up some of the summer surplus. Shaheen from A Seasonal Veg Table has done so with these courgette brownies, much to her nephew’s delight. Miss GF gets creative in the kitchen again with these stunning chocolate & mint whoopee pies. You’ll find the recipe over at The Gluten Free Alchemist. Quick desserts put together in a jar for picnics are a fabulous idea from Claire at She Eats. These three ingredient no bake dessert pots can be put together in no time and contains rich chocolate spread – I’m in. My contribution are these organic chocolate truffles made with only three ingredients and a pinch of salt. I’m a big fan of energy balls as they’re so easy to make, but these are the first I’ve made with no nuts or seeds. These gooey soft bake cookies with dairy milk chocolate chunks from Debbie at Proper Foodie are apparently the best soft bake cookies ever. 13 Baking Hot Chocolate Recipes. PIN IT. 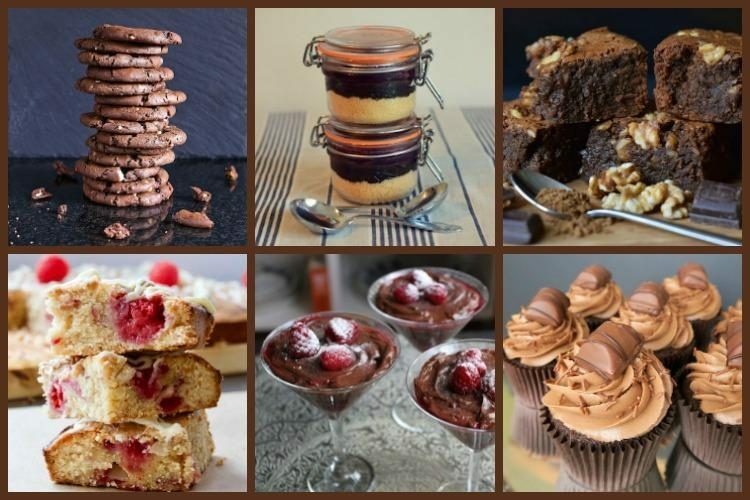 So good to see lots of chocolate inspiration – it is baking weather here and I need ideas though I am still not sure where to start so I think one of each please! So many delightful chocolate recipes! Can’t wait to get home and start baking. They all look amazingly delicious. Do join in with August’s #WeShouldCocoa if you’re posting something chocolatey this month. That’s the beauty of chocolate, it’s always highly desirable no matter the weather 🙂 Some great recipes as always! There’s always a place in my heart (& tummy!) for chocolate now matter the season 😉 Scrummy round up too Choclette, I’m particularly coveting Kate’s Chocolate & Peanut Butter cookies! I have a deep love for chocolate. Have to try these summer recipes out as soon as possible. Chocolate is amazing stuff. I hope you manage to make some of these recipes. Lovely round up as always Choclette. Thank you so much for allowing Miss GF to sneak in an extra entry with her whoopie pies! I seem unable to find the linky to this month’s offerings and I am about to go off for a week…. Would you accept the link via comment???? Hi Kate. Ah yes, I stupidly forgot to add the linky. I’ll do my best to remember the link here, breakfast cake sounds to good to forget. I hope you have a wonderful holiday. It all looks so good – Im sure The Peachicks will be making a few over the next couple of weeks! Loving the look of all of these! Especially Elinor’s chocolate pudding and Kate’s mint whoopie pies, yum. Hi Caroline. So sorry you’re having problems this time around. I’m not sure what happened, but everything seems OK as far as I can tell. I’ve just added yours.